• Specified types in accordance with the ATEX directive are suitable for explosive atmospheres or are made of corrosion resistant stainless steel and therefore particularly easy to clean. • Compact linear drives with or without guide: mechanically coupled cylinders with optimised mounting options for simple mounting and magnetically coupled cylinders for use as a pressure-tight and zero-leakage system. • Specified types are suitable for potentially explosive atmospheres in accordance with the ATEX directive. • More thrust than conventional cylinders by connecting in series 2, 3 or 4 cylinders with the same piston diameter and the same stroke. • By connecting 2 to 5 cylinders in series with the same piston diameter and different stroke lengths, up to 6 positions can be approached. • Cylinder with piston rod with reinforced piston rod and bearing to withstand large lateral forces. • For stopping or separating when transporting workpiece carriers or pallets – smooth, low noise and safe stopping. 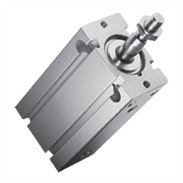 • Compact cylinders without piston rod with membrane and a much shorter stroke than bellows cylinders.